Dr. Becki Cohill joined the faculty at the University of St. Augustine for Health Sciences in June 2015 as an associate professor. She worked as a practitioner for over 25 years in Colorado, Utah, and Oklahoma in a variety of areas of practice. 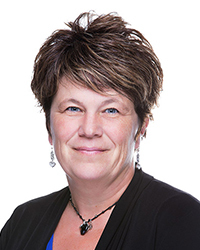 She is a 1990 graduate of Colorado State University and completed her Clinical Doctor of Occupational Therapy from Rocky Mountain University of Health Professions in 2014. She is involved in the development of new curriculum for MOT and OTD pediatric coursework, occupational therapy theory, and has acted as the interim fieldwork coordinator. Prior to joining USAHS, she worked as an occupational therapist in multiple settings, including hospital-based acute care, skilled nursing facility, general outpatient, and home health care. Her passion is pediatric practice, and she has worked in multiple settings in pediatrics including hospital-based, outpatient, school-based practice and early intervention. She has worked as a practitioner for over 27 years in Colorado, Utah, and Oklahoma in a variety of areas of practice. Noting a shortage of early intervention providers, she participated in the Early Intervention Colorado Telehealth Pilot Program. The pilot program resulted in the development of the telehealth online learning modules for Early Intervention Colorado/Colorado Office of Early Childhood. Dr. Cohill is currently providing telehealth early intervention occupational therapy to American Samoa-Helping Hands EI program. She has presented on this topic at the yearly conference for AOTA, OTACO, and Division of Early Childhood National Conference.